Click here to preview all Carmel Valley homes for sale in the Village Views neighborhood. For all available Carmel Valley real estate, click here. In 2018, 18 homes sold in this neighborhood. A beautiful, 3 bedroom, 3 bathroom Hacienda overlooking the valley with 3,400 SqFt of living space on 5+ acres and selling for 3.275 million. The least expensive home sold for 860K for a 3 bedroom, 2 bathroom home with 1,500 SqFt of living space on .35 acres located just blocks to the shops and wineries in Carmel Valley Village. In 2017 33 homes sold in this neighborhood. The most expensive home to sell, sold for 1.85 million for a 5 bedroom, 3 full and 2 half bathroom, California adobe with 5,374 SqFt of living space on 11.88 acres. The least expensive home to sell, sold for 754,665 for a 2 bedroom, 2.5 bathroom home located in the “White Oaks” complex and had 2,117 SqFt of living space on a 3,588 SqFt lot. 27 homes sold in this neighborhood in 2016. 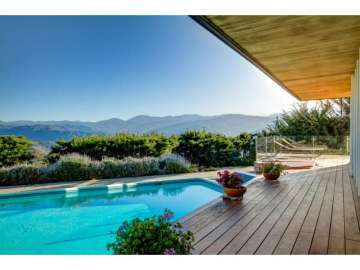 The most expensive home to sell, sold for 1.895 million for a 2 bedroom, 2.5 bathroom mid-century home with 2,562 SqFt of living space on 3+ acres, complete with a pool. The least expensive home to sell, sold for 700K for a 3 bedroom, 2 bathroom, ranch-style home with 1,817 SqFt of living space on 2.5 acres. 26 homes sold in this neighborhood in 2015. The most expensive home to sell, sold for 2.5 million for a 3 bedroom, 3.5 bathroom home with 3,347 SqFt of living space on a 1.19 acre lot complete with guest house. The least expensive home to sell sold for 675K for a 2 bedroom, 2.5 bathroom, “White Oaks” unit with 2,117 SqFt of living space on 3,588 SqFt lot. In 2014, there were 22 homes that sold in this neighborhood. The most expensive home sold for 1.725 million and was a 3,452 SqFt home on a 53,143 SqFt lot, while the least expensive home sold for 426K and was a 1,410 SqFt home on 77,537 SqFt lot. In 2013, 25 homes sold in this neighborhood. The most expensive home sold for 2.06 million and was a 6,300 SqFt home on a 217,843 SqFt lot, while the least expensive home sold for 600K and was a 840 SqFt home on a 43,560 SqFt lot. In 2012, 25 homes sold in this neighborhood. The most expensive home sold for 1.375 million for a 3 bedroom, 3 bathroom, nicely remodled home, with 2,800 SqFt of living space and was on a 52,707 SqFt lot, complete with guest house. The least expensive home sold for 425K and was a 3 bedroom, 2 bathroom home with 1,408 SqFt of living space and was situated on a 43,560 SqFt lot and needed some updating. Village Views proximity to Carmel Valley Village makes it a coveted location to call home. In recent years the number of wineries and tasting rooms has flourished making it a perfect location to sample superb local wines and entertain visiting friends and family. Taste gorgeous Pinot Noir, Chardonnay and Syrah from Talbott, Georis and Boekenoogen among many others in a relaxed casual environment. There are antique stores and great restaurants including Corkscrew, Café Rustica and Wills Fargo Dining House and Saloon, a classic landmark steakhouse since 1959. Just 2 miles down Carmel Valley Road you will find vibrant purple lavender and vineyards welcoming you to Bernardus Lodge, a luxury high end retreat with the highly rated Marinus restaurant which features over 1,800 fine wines, a tasting room and spa. With an average of 300 days of sunshine every year, Carmel Valley warms your heart and spirit with sun soaked days and calm starry nights that cool comfortably with the fresh breezes off the ocean. You can take advantage of the pleasant weather and be active all year long with a vast variety of outdoor recreational activities including road bilking down the winding Valley road, mountain biking in the adventurous mountain terrain and trails, horseback riding, hiking at Garland Park or simply spend the afternoon in the garden planting in the rich soil or swimming in your own refreshing pool. A scenic 20 minute drive west and you will arrive at the coast where you can drive into Carmel-by-the-Sea to experience its quaint storybook charms, world class dining and shopping down Ocean Avenue. Nearby Pebble Beach, a golf mecca with a global reputation for the world’s most beautiful and challenging golf courses will delight golfers and spectators alike. Play the greens or attend one of the many yearly tournaments including the Pebble Beach AT&T Pro Am, a tournament grounded in tradition from the days of Bing Crosby. Car enthusiasts flock to Pebble each August as even the fog cannot keep away the tradition of the Concours d’Elegance, which showcases rare exotic and classic cars from the world’s most discriminating collections. The events on the Monterey Peninsula are always exciting and top notch and you will have a first row seat to attend with your home in Carmel Valley. Most importantly owning a home in Village Views will provide you with the warm, relaxed atmosphere of living in the Valley where there is an appreciation of nature, and a laid back approach to everyday living. You will cherish the majestic oaks, wildflowers, soaring red tailed hawks and verdant green hills. Watching the sunsets from your home with a view and mornings waking to the singing birds as you sip coffee on your deck and take in the morning sun. What a wonderful place to call home and create memories.